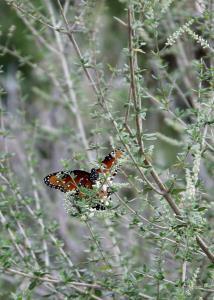 Fortunately for the butterfly, the recent rains have caused the Bee Brush to bloom and provide some food. Temp started at 73, ended at 85. Most to partly cloudy, sporadic, light breeze. Somewhat humid. Some siginificant (for this area) rain last week "green-ed" up the park quite a bit and put some water in the reservoir, creeks and rivers. Most of the trails were wet to one degree or another and it was very apparent where the rain water collected. The trails are still easy to see but the vegetation is covering more portions than before and there are more areas that will need repair because of the water run-off or the longhorns and horses causing deep tracks in the muddy soil. Bee brush is still in bloom (photo attached) providing butterflies and other insects with food. Soon the Monarchs will begin their migration and will need whatever sustinence they can find. Thistle is also making an appearance and there are quite a few prickly pear tunas are still evident. Grasshoppers are abundant as well! It was a good hike but a longer one than usual because of the extra hiking from the parking area across the river to Bell's Trailhead. Water available in the campground by Bell's Trailhead. Toilets also available at other areas of the campground. Water, shade, info kiosk and dry toilets available at River Bend Campground. Toilets are not serviced/maintained on a regular basis so caution is advised if you use them. IMPORTANT - Park trail maps have been recently updated but the maps displayed at the info kiosks have not - trust the park's trail map if in doubt.